An attractive label greets the eye. Perhaps it's the small image of a magpie that gets my attention? My favourite Australian bird would have to be either the Magpie or Butcher Bird. I'd love to see a Butcher Bird on a label mind you - can someone sort that out, please? 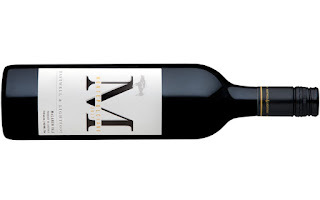 Montepulciano from McLaren Vale here. The Vale is quite the Mediterranean variety Mecca of sorts -at least for the warmer climate regions of Australia. The back label says Wine made for eating. Speaking for its roots, that's the Italian way, isn't it? There's an earthy and minerally feel to the wine. Dark in appearance with mulberries and blueberries plus unmistakable oregano. Powdery and mouth sapping tannins call for plates of bolognese and ragu. Yep, it's made for eating.